I received my free vegetartian and vegan starter kit from PETA and I love reading all the information. 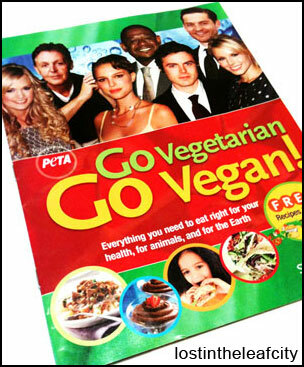 One thing that struck me is the number of the vegan/vegetarian celebrities. They are not only good in acting but in having a healthy lifestyle, much harder than the former. I’m no actor nor I ever planned to become one but starting to go vegan is so hard. And I’m not acting when I tried it for the first time. I’ve been mindful in what I’m eating: avoiding fats, having daily consumption of fruits or vegetables, sometimes both, that at times I crave for sweets and tidbits of junk. A little consumption rewards deprivation. But at some point, it goes out of control. That’s when I decided to try a vegetarian/vegan recipe. I want to stop bouncing on and off a healthy diet. I’m exploring the recipe on PETA’s website and I learned that it isn’t hard to prepare all the food but finding the ingredients is. I have to familiarize myself with brands and not only look at the price and anything with the word less—fat, salt, or sugar—or with zero percentage. Going vegetarian/vegan becomes part of my challenges in 2013. I didn’t see it coming, but I’m glad I jumped in. The biggest benefit in getting the free vegetarian and vegan starter kit is being aware of the plight of animals. The way they are treated for human consumption remained unnoticed (consciously most of the time) to many, and I happen to belong in that crowd. If you are thinking of changing your unhealthy diet, get the vegetarian and vegan starter kit for yourself and for others wherever they are. Do others a favor and you’ve also helped the animals. Have you made the change? Do you have any advice for anyone starting the transition? I would love to know your favorite vegetarian/vegan recipe so let me know in the comment.